Children feel victorious when they have big accomplishments like staying dry throughout the day. With summer just around the corner, your child might not feel comfortable attending overnight social events like camps and sleepovers because bedtime becomes a battle rendering them powerless from defeat. But, according to Renee Mercer, a pediatric nurse practitioner and specialist of enuresis for over 25 years says it doesn’t have to be. In Mercer’s new book, Seven Steps to Nighttime Dryness: A Practical Guide for Parents of Children with Bedwetting, Second Edition (Brookeville Media LLC), she arms parents with 9 strategies to help Ctheir children turns their bet-wetting troubles into triumphs. Through a series of easy-to-tackle steps and with the help of a bedwetting alarm, you can work with your child to achieve dry nights in as little as ten weeks. So if you start now, you’ll both be able to rest easy much earlier than you ever expected, says Mercer. Strategy #1: Make your job easier now. As you ease into the steps that will help your child stop bedwetting, do what you can to make nights, mornings, and cleanups as easy as possible on yourself and on your child. If you aren’t already doing so, decrease your workload by using disposable pants, waterproof pads, vinyl mattress covers, etc. Strategy #2: Get the whole family on board. This isn’t just your child’s challenge to overcome—he’ll need your continued help, support, and encouragement. Keep in mind that you’ll be waking up during the night as your child learns to establish a nighttime routine, as well as helping him get used to any alarms he might use and monitoring his food and liquid intakes before bed. Strategy #3: Establish a bedtime routine. 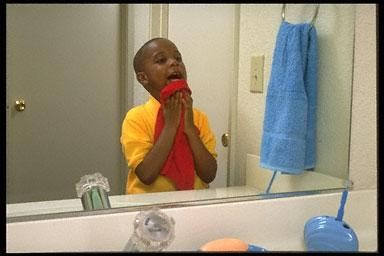 Some children are more likely to experience a pattern of dryness when they have a regular nightly routine. To the extent that it’s possible, try to start working toward dryness at a time when no disruptive events such as holidays, vacations, moves, the birth of a sibling, etc. are on the horizon. Strategy #4:Refrain from punishment. It is crucial to realize that kids do not wet their beds voluntarily. Bedwetting can be caused by a multitude of factors, including genetics, small functional bladder capacity, food sensitivities, high nighttime urine production, and even constipation—but a wet spot in the morning is not a result of your child being too “lazy” to get out of bed. For this reason, punishing a child for bedwetting is ineffectual, and potentially harmful. Strategy #5: Invest in an alarm. …a bedwetting alarm, that is! Unlike conventional alarm clocks, bedwetting alarms don’t ring at a pre-set time. A moisture sensor triggers the alarm, which wakes you and your child. At this point, you can make sure that your child gets up and goes to the bathroom. And after a few weeks of associating the alarm with the need to urinate, your child’s brain will begin to understand the feeling of a full bladder, and she’ll wake up on her own. Strategy #6: Record your child’s progress. During your efforts to achieve nighttime dryness, track your child’s progress from the time you start to use a bedwetting alarm. As accurately as you can, record the frequency of his bedwetting episodes, the size of the wet spot, the time the alarm sounds, and the number of dry nights in a row he achieves. Also, keep a log of what he eats and drinks, how tired he is, and if he’s sick—these things can help you identify possible bedwetting triggers. Strategy #7: Create a reward system. A little incentive never hurt anyone, and when it comes to bedwetting, having a reward system in place can keep your child motivated and help her to persevere when she becomes discouraged. Set up a system that acknowledges both cooperation with your evening and nighttime routine (something your child can control) and dry nights (something she can’t). Strategy #8: Do a sleep-away trial run. Once your child has achieved dryness, consider doing a “trial run sleepover” with grandparents or another trusted relative before leaping right into overnight birthday parties and camps! In many cases, this allows children to get used to sleeping in an unfamiliar place without worrying they might slip up and have a wet night. Strategy #9: Stay the course! Your child will probably experience some victories as well as some setbacks on the journey to dry nights. Remember that each child progresses at his or her own rate, and that most continue to wet nightly and have little, if any, independent response to the alarm the first few weeks. Don’t be discouraged—eventually, you will see a decrease in the frequency of wetting episodes. I really appreciate you guys writing this to educate parents about the bedwetting topic. What i would like to add here is that investing in bedwetting alarms is a very great option and i would personally recommend Chummie Bedwetting Alarm to everyone.